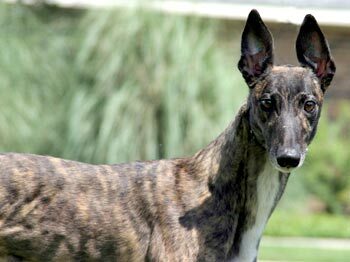 BeBe, aka WJK Bennett, is a beautiful, small, 3-year-old dark brindle female born April 10, 2006. Her sire is Craigie Whistler, making her grand sire Molotov, and her dam is TW Twister. BeBe’s 34-race career started on January 13, 2008, at Valley Race Park in Harlingen, TX, moved to Wonderland, and then returned to Valley Race Park where her racing career was cut short on January 10, 2009, with a broken right hock. Dr. Bob Radasch of the Dallas Veterinary Surgical Center performed surgery on Thursday, January 29. BeBe’s injury was more severe than originally thought due to an additional torn ligament at the base of the calcaneous and fourth tarsal bone. Her leg was stabilized with a screw in lag fashion, and she was in a cast for 12 weeks, with weekly bandage changes. Her leg is now healed, and BeBe is ready to find her forever home! Bebe is not cat trainable. She didn’t pay much attention to the black cat that trotted by her when she first entered the house. However, hearing a cat meow and seeing them jump to and from high places really piqued her interest. She has not been tested with small animals yet. 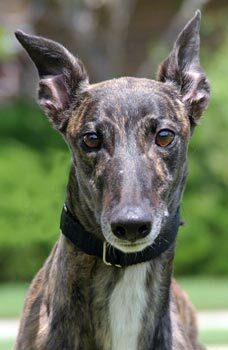 Bebe is a wonderful, petite greyhound. Her recovery has taken longer than expected. She had a complicated fracture which took additional time to heal and in the midst developed a severe pressure sore that took several weeks to heal. We, as foster parents, were thrilled to have her with us longer. Through it all this little girl has been the most upbeat foster. Bebe has been consistently happy, affectionate, and outgoing. Her tail never stops wagging. Bebe is ready to participate in any games and is very comical. 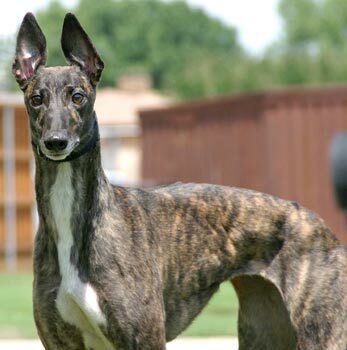 Greyhound nobility aside – she just wants to have fun and be silly. She loves to “talk”. She starts out rooing, then opens and closes her mouth and words come out. Bebe does this “talking” with purpose. She actually tells you in the morning when she is ready to go out, and when she wants to eat. We have enjoyed this alien language of hers and translating the meaning of her gibberish. Bebe has learned how to “bow” on command – for a treat, of course. She likes to lay on her back while wiggling and stretching her front paws, beckoning for a tummy rub and some love. Our other canines are Bebe’s best buddies. She loves playing with a ball and toys. Bebe is crate trained and house trained. She is very good on outdoor walks. When she sees squirrels and bunnies her ears go up, she gets very focused and tense. We are working on the “leave it” command when that occurs and she is improving.